Growing up as a Navy dependent, I was almost always near the ocean. Yet I never met a commercial fisherman until I moved to Hatteras Island. My first encounter was in 1974 when a new found friend, Bruce Midgett, took me along to fish his gill nets off Bay Landing, south of Salvo. I brought my Yashica camera along and took a few shots. I’ve always been excited looking at this picture of Bruce holding a speckled trout. It revealed another world to me and I’ve embraced the small commercial fisherman ever since. 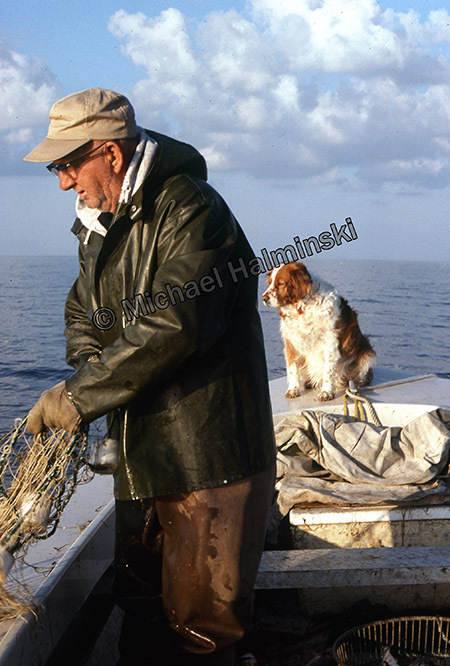 Early one morning in 1978, 65 year-old Burgess Hooper took me fishing on the Pamlico Sound. I was impressed at his knowledge and vitality out on the water. 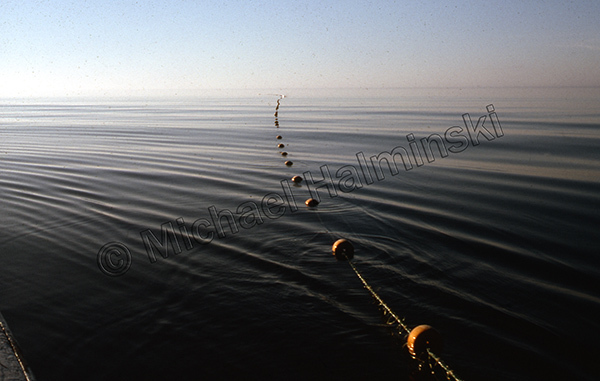 My favorite shot came later that morning while Burgess hauled in his favorite cotton net, made for catching bluefish. He always took Princess with him. She was just as anxious to see what was caught. Burgess passed away about ten years later, and a week after that Princess died. 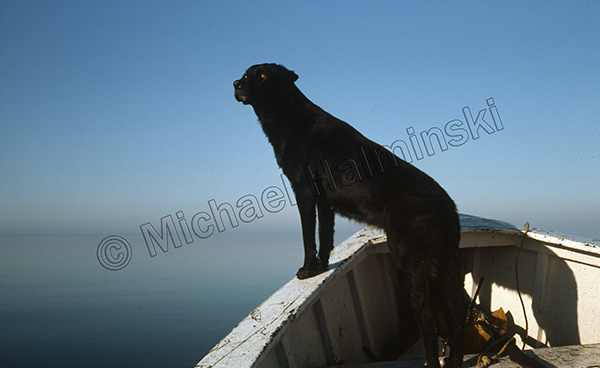 In 1977, my good friend Roger Wooleyhan was also fishing the Pamlico Sound and he always took his faithful black lab, Moose. Calm water usually means not much of a catch, but the glassy conditions always make for a pleasant boat ride. 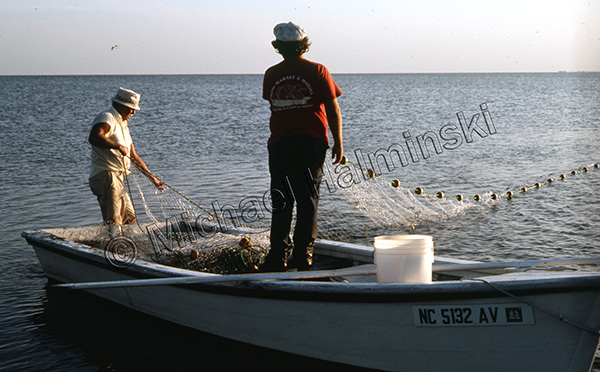 A 1985 assignment for an Outer Banks Magazine story, hooked me up with crabber Scott Bridges pulling his pots near Hatteras Inlet. 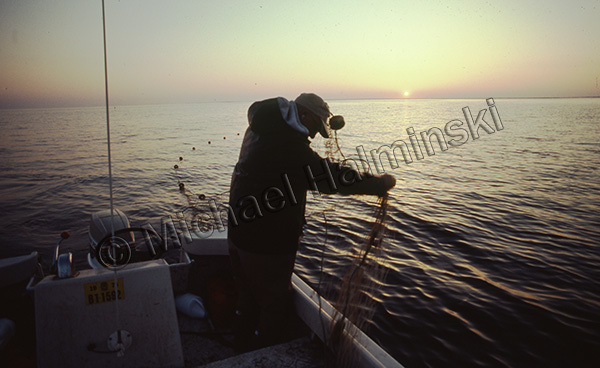 The labor of a commercial fisherman never ends. Maintenance of gear is a constant. 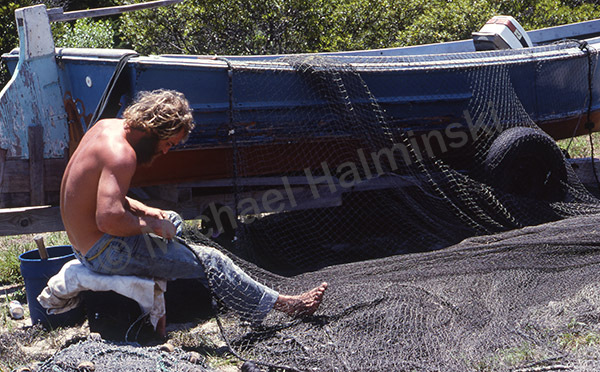 I happened to visit Bruce Midgett at home in 1982 as he was mending a pound net. 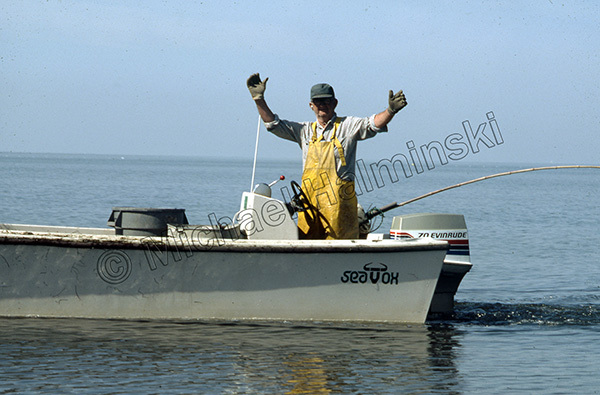 In the Fall of 1982 I was driving by Bay Landing and stopped to watch Raymond Midgett and his son Robin, also known as Tater, hauling in after drifting a gill net. 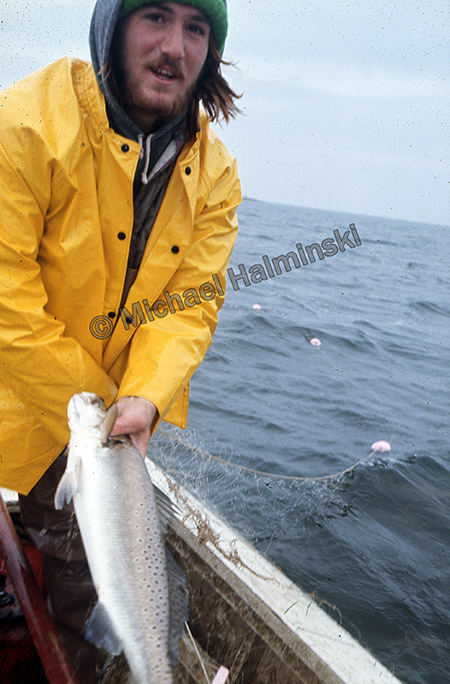 The Spring of 1980, I tried a stint at commercial fishing and did okay. As I was fishing a net, Burgess Hooper dropped by to say hello. A week later my motor broke down and he had to tow me in. 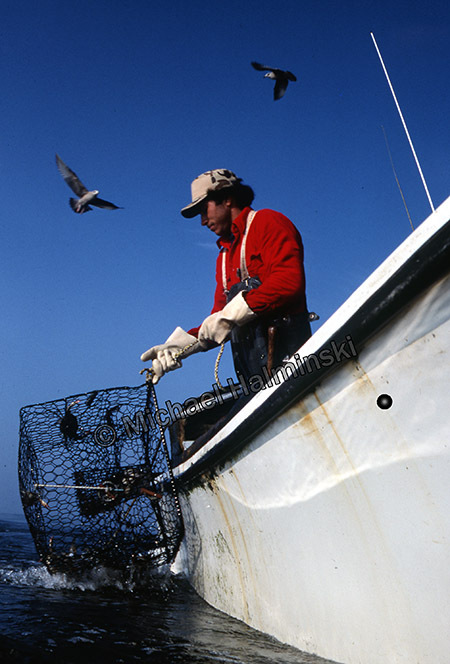 The commercial fishermen looked out for one another and generously gave fish to their friends and neighbors. Today with commercial fishing, the writing is on the wall. Times have changed. They are being more regulated and eventually their livelihoods will be jeopardized, if not gone. I’ve been a witness to something that will not happen again as it did decades ago. This entry was posted in commercial fishing, boat, pamilco sound, gillnetting, history, Outer Banks, Pamlico Sound, People on February 21, 2017 by j0jgvm89bj.